Insert paper liners in 12-cup muffin pan. In a measuring cup combine liquid ingredients. Add liquids to flour mixture and combine well using a spatula. Divide batter evenly into cups. Bake for 20 minutes. Remove to rack to cool completely. Beat butter, cream cheese, & vanilla with electric mixer. Add powdered sugar and a tiny bit of milk to obtain a nice, thick consistency. 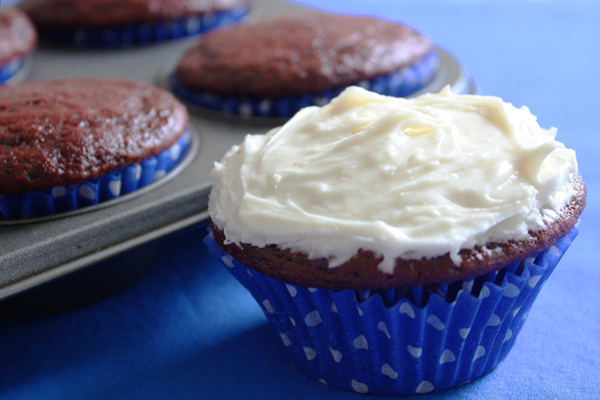 59 Comments on "Easy Red Velvet Cupcakes"
As usual your recipes never disappoint! When I’ve made other scratch made cakes/cupcakes they are dry and have no flavor. These are moist, flavorful and the icing is the BEST cream cheese icing I’ve made. Thank you! There are sooooo good. Favorite cupcakes EVER! Even with your “homemade” buttermilk, I would not change anything else in the recipe. Your recipes always turn out great… But I felt the red velvet cake was a bit sticky. The buttermilk I used was really thick(undiluted). I tried baking it in an 8 inch round pan. What could be the reason? It’s not a cake recipe, but cupcakes. Try following the recipe exactly but use a muffin pan. i dubbed your recipe for a cake which i baked in 2 9 inch pans and it came out great! i also made them in to cake pops for friend and its was so good and it was so moist that i didn’t need that much frosting! What do u mean by dubbed? U mean doubled? Can i make this into a cake instead & just use the choc frosting? Im guessing it would still taste delish! I don’t know, you would have to try. These turned out great! Instead of cream cheese frosting I used you’re chocolate frosting recipe! Thanks. I can only find buttermilk powder from the local store. Should I use 1 cup or dilute it? Pls advise, thank you. I have never used it but it seems to me you would follow the instructions on the package to make one cup and just use that. I know that fresh lemon juice works. I want to know why my butter cream is yellow and not white? What am I do wrong? Pls help me.. It has to be one of your ingredients. Can you please list exactly each ingredient you used in the frosting? Then I may be able to help. I used 1cup powdered sugar, 3 tbsp butter, 1 tsp vanilla extract and 2 to 3 tbsp water. Please help me, use how many amount ingredient to make 12 cup cake or one whole cake? Your frosting could be yellow because you used more butter and vanilla than my recipes and they both have color. Butter is yellow and vanilla is dark so that’s my best guess. My frosting is white because my recipe uses cream cheese and less butter and vanilla. May I know, if i don’t want the cream cheese then how much butter and powdered sugar should I use? How much milk should I add? Enough to make 12 cup cake. Can replace the butter milk to sour cream? Or something else, what you suggest? Is it ok if i dont use the food coloring? Thanks. Great recipe! But is it okay if I replace the buttermilk with fresh milk? It’s hard to find buttermilk in my country. In baking, milk can not replace buttermilk because buttermilk provides the acid needed for the cupcakes to rise and be light. If you can’t find buttermilk you could try yogurt thinned with a little milk until it’s the consistence of buttermilk. But honestly, I have never found a really good replacement for buttermilk. 1) Your oven may be hotter in the upper area. 2) The cupcakes were too close to the top of the oven. 4) If it’s a small oven, the tops will likely be too close to the top & get too much heat. Is there any other way I can help? If we dont have the mixer will the cream cheese frosting turn out not as good as the mixed one? But can you do the frosting without the mixer? You can not make this fluffy frosting without a mixer. You can try using a spoon to stir together the powdered sugar with reduced fat cream cheese, which is softer than full fat, and it will not be light but it will probably give you a topping you can spread. This is a hard question to answer because I am just a home cook sharing the way I make things and I have never made frosting without an electric mixer. I hope this helps. made this many times already now. they are awesome! thanks jenny. Sorry, I don’t know. I don’t count calories. What is the sugar you used for the frosting? What do I do if I don’t have it? Can I make cookies with this recipe? Or… try my double chocolate chip cookies. Hi! I just want to ask if I can just use a regular milk because I have no buttermilk. And what if I want to make more like 24 or 32 cupcakes do I just double the measurement? Thanks! You really can’t substitute regular milk for buttermilk because you need the acid in the buttermilk to react with the baking soda for light cupcakes. Once when I was out of buttermilk, I mixed some plain low fat yogurt with milk, about 1/2 and 1/2 and it worked pretty well as a substitute. Before you double this recipe, I would make one dozen with your substitution to make sure it works. I have never doubled this recipe but I see no reason why it wouldn’t work. I’m sorry for asking again..it is okay for not using vineger but replace it with baking powder? I suppose you could but you wouldn’t need much baking powder, if any. I’d say not more than one teaspoon of baking powder. If replace white vinegar with apple cider, it is okay? You need the acid in vinegar to react with the baking soda, which starts the chemical reaction that produces carbon dioxide, which is what makes the batter rise when it bakes. If you mean apple cider VINEGAR, then I believe it would work… but if you mean apple cider, I don’t think it would have enough acid to be effective. I forgot to put vapple cider vineger..then how about the oil? If put vegetable oil or olive oil? Yes, another oil would work but I would choose EXTRA LIGHT olive oil to make sure there is no olive flavor. I bake with extra light olive oil (see my new marble loaf cake recipe) and it leaves no olive flavor at all. Vegetable oil would be safe for being flavorless. I hope you get good cupcakes 🙂 let me know! Absolutely yummy…. and not too sweet. How many calories are they?? 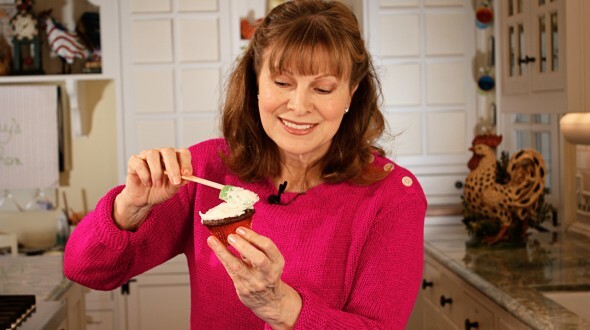 I want to make some red velvet cupcakes for mothers day! I use olive oil but still healthy still extremely dilisous ive seen every video. Hi Christian, how much olive oil did u use? The same amount or lesser?